Description: AbsoluteTelnet is a fast 32-bit telnet client that also supports SSH1, SSH2, SFTP, TAPI Dialup and direct COM port connections. Rock solid emulation gives AbsoluteTelnet the edge, along with SOCKS Proxy, port forwarding, X11 forwarding, XTERM Mouse, session logging, Passthru printing, UTF8, charset translation, Color/Font settings, and a host of terminal options round out a feature set that is sure to satisfy the most demanding user. Description: Axessh is a Windows SSH client. It is a superb terminal emulator/telnet client for Windows. It provides SSH capabilities to Axessh without sacrificing any of existing functionality. Furthermore, Axessh has been developed entirely outside of the USA, and can be sold anywhere in the world (apart from places where people aren't allowed to own cryptographic software). SSH is the industry standard for remote logins. Description: MobaXterm is a set of Unix commands (GNU/Cygwin) included in a single portable exe file. 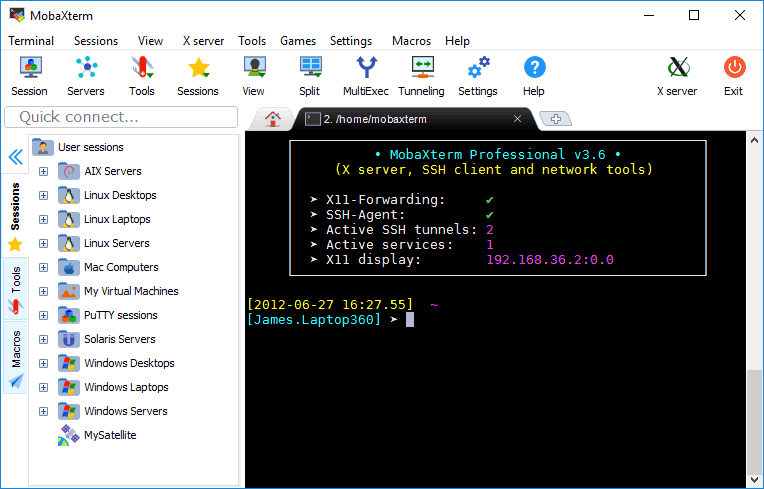 MobaXterm integrates an X server and several network clients (SSH, RDP, VNC, telnet, rlogin, sftp, ftp, ...) accessible through a tab- based terminal. MobaXterm also integrates a complete set of GNU/Unix commands. 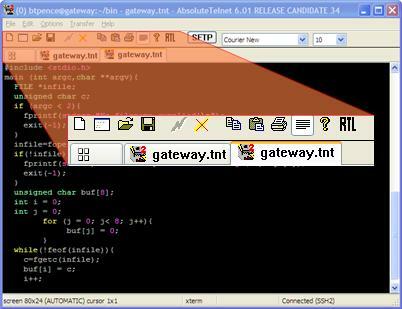 Description: A fast, powerful and inexpensive telnet client application. TN3270 Plus connects Windows PCs to IBM mainframe, AS/400, and UNIX systems via TCP/IP. TN3270 Plus delivers 3270, 5250, VT100, VT220 and ANSI terminal emulation and 3287 and 5250 printer emulation. 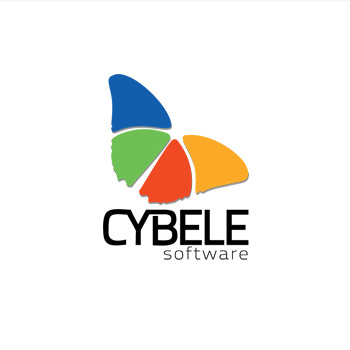 Advanced features include keyboard mapping, multiple sessions, macros, scripts, DDE, WinHLLAPI, LPD, FTP, SSH and SSL. All packaged in a lightweight, reliable and easy to use product. Description: z/Scope Workbench is a unique solution for TN3270, TN 5250 and VTxxx Terminal Emulation and Code editor for Mainframe, AS/400 and Unix. z/Scope Workbench provides all the necessary tools that Systems Administrators, Programmers and every IT professional need to access z/Series, i/Series and Unix servers, integrated in one software package, so they can do their job easier and faster. Description: z/Scope Express is a light-weight, fast and secure terminal emulator, featuring an integrated tabbed multisession emulation. It runs under Windows 98/ME/NT/2K/XP platforms. z/Scope provides full support of Internet-Standard communication protocols Telnet, SSH1/SSH2, with emulation support for VT100, VT220, VT320, VT420 Hosts, and file transfer protocols FTP, Kermit, X-Modem, Y-Modem and X-Modem. Now includes support for VNC and RDP protocols. Description: z/Scope Express VT is a light-weight, fast and secure terminal emulator, featuring an integrated tabbed multisession emulation. It runs under Windows 98/ME/NT/2K/XP platforms. z/Scope provides full support of Internet-Standard communication protocols Telnet, SSH1/SSH2, with emulation support for VT100, VT220, VT320, VT420 Hosts, and file transfer protocols FTP, Kermit, X-Modem, Y-Modem and X-Modem. Description: z/Scope Classic is a SSL/SSH enabled multi-session terminal emulator for accessing AS/400 iSeries, IBM Mainframes and UNIX hosts under Windows platforms. z/Scope is solid, fast, secure, inexpensive and provides users with state-of-the-art interfaces. z/Scope Classic will take your terminal emulation experience to a superior level! z/Scope is a new concept in terminal emulation solutions, ideal to replace the old, heavy and expensive ones! Description: z/Scope Express 3270 offers an unmatched look&feel and the most intuitive and user-friendly interface. Also gives full support of Internet-Standard comunication protocols TN3270E, SSL 2/3 and TLS 1. With z/Scope Express you will have all the necessary basic tools to experience a modern agile and fast terminal emulation. In addition, you will only use a very little portion of your PC memory, leaving more resources for other critical tasks. Description: z/Scope Express 5250 offers an unmatched look&feel and the most intuitive and user-friendly interface. Also gives full support of Internet-Standard comunication protocols TN5250E, SSL 2/3 and TLS 1. With z/Scope Express you will have all the necessary basic tools to experience a modern agile and fast terminal emulation. In addition, you will only use a very little portion of your PC memory, leaving more resources for other critical tasks.